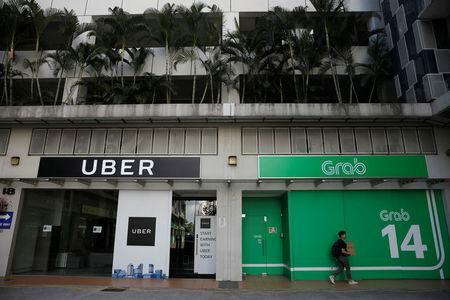 Last month, Singapore slapped ride-hailing firms Grab and Uber with fines and imposed restrictions on their businesses to open up the market to competitors, after concluding that their merger had driven up prices. It fined Grab S$6.42 million ($4.7 million) and Uber S$6.58 million. Uber said it was making the appeal independently of Grab, as a matter of principle. Separately, Grab said it would not appeal the regulator's decision. The Competition and Consumer Commission of Singapore's ruling that the transaction led to a substantial lessening of competition, and that Uber had intentionally breached the law, was "unsupported and incorrect", Uber said in a statement. Uber asked the CCCS to annul its fine, and said the regulator had used a very narrow definition of the ride-hailing market. It also pointed to Go-Jek's impending entry into the city-state, saying the Indonesian ride-hailing company would make for a formidable competitor. Uber disputed the CCCS' allegation that Uber knew that the transaction infringed the law but nevertheless moved ahead. "To the contrary, our view has always been that in a properly defined market - including at the very least ride-sharing, street-hail taxis and new entrants - the transaction respects the law and does not raise significant concerns," it said. Uber sold its Southeast Asian business to bigger regional rival Grab in March in exchange for a 27.5 percent stake in the Singapore-based firm. But the deal invited regulatory scrutiny. Last week, the Philippines' competition watchdog also fined the two firms, saying they consummated their merger too soon and that the quality of service had suffered. "I do not expect that this decision or definition of the market used in Singapore by CCCS would significantly affect Uber elsewhere," said Walter Theseira, an economics professor at the Singapore University of Social Sciences. He said, however, that Uber may have an interest in conducting an economic analysis of the definition of the market to inform and contest similar cases elsewhere.